Importer of a wide range of products which include ito (indium tin oxide) coated pet plastic - 100mm x 200mm, ito (indium tin oxide) coated glass - 50mm x 50mm and ito coated glass. 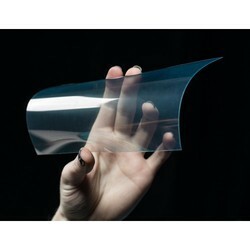 ITO is a clear, conductive liquid/film and here we have it as a coating on a flexible plastic (PET) sheet. This is a very interesting and fun material, also used in scientific research and LCD/OLED manufacture! One side of the plastic is coated in ITO, you can use the flat of a blade or similar to scrape away some of the film to create 'traces'. It may also be possible to use a laser cutter to pattern it. We're looking forward to seeing what people do with this cool stuff! It's not possible to solder to this material, but you can use conductive inks, paints, copper tape (with conductive adhesive) and alligator clips to make contact. 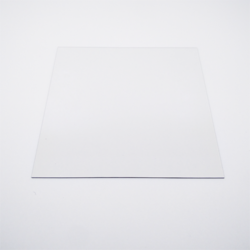 ITO is a clear, conductive liquid/film and here we have it as a coating on a 1mm glass sheet. 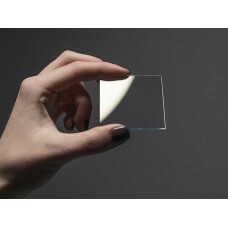 This is a very interesting and fun material, also used in scientific research and LCD/OLED manufacture! One side of the glass is coated in ITO, you can use the flat of a blade or similar to scrape away some of the film to create 'traces' - just be careful because as it is glass, any nick-lines will cause it to break on the line (that's how a glass cutter works) It may also be possible to use a laser cutter to pattern it. We're looking forward to seeing what people do with this cool stuff! Note: This product is for hobbyist use and experimentation - what does that mean? Don't use this for your big start up idea or KickStarter! Looking for ITO Coated ?